577 pages | 905 B/W Illus. 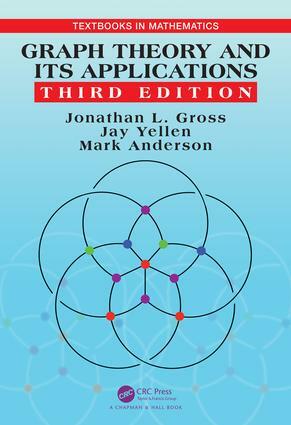 Graph Theory and Its Applications, Third Edition is the latest edition of the international, bestselling textbook for undergraduate courses in graph theory, yet it is expansive enough to be used for graduate courses as well. The textbook takes a comprehensive, accessible approach to graph theory, integrating careful exposition of classical developments with emerging methods, models, and practical needs. The authors’ unparalleled treatment is an ideal text for a two-semester course and a variety of one-semester classes, from an introductory one-semester course to courses slanted toward classical graph theory, operations research, data structures and algorithms, or algebra and topology. Jonathan L. Gross is a professor of computer science at Columbia University. His research interests include topology and graph theory. Jay Yellen is a professor of mathematics at Rollins College. His current areas of research include graph theory, combinatorics, and algorithms. Mark Anderson is also a mathematics professor at Rollins College. His research interest in graph theory centers on the topological or algebraic side. Graphs and Digraphs. Common Families of Graphs. Graph Modeling Applications. Walks and Distance. Paths, Cycles, and Trees. Vertex and Edge Attributes. Graph Isomorphism. Automorphism and Symmetry. Subgraphs. Some Graph Operations. Tests for Non-Isomorphism. Matrix Representation. More Graph Operations. Characterizations and Properties of Trees. Rooted Trees, Ordered Trees, and Binary Trees. Binary-Tree Traversals. Binary-Search Trees. Huffman Trees and Optimal Prefix Codes. Priority Trees. Counting Labeled Trees. Counting Binary Trees. Tree Growing. Depth-First and Breadth-First Search. Minimum Spanning Trees and Shortest Paths. Applications of Depth-First Search. Cycles, Edge-Cuts, and Spanning Trees. Graphs and Vector Spaces. Matroids and the Greedy Algorithm. Vertex and Edge-Connectivity. Constructing Reliable Networks. Max-Min Duality and Menger’s Theorems. Block Decompositions. Eulerian Trails and Tours. DeBruijn Sequences and Postman Problems. Hamiltonian Paths and Cycles. Gray Codes and Traveling Salesman Problems. Planar Drawings and Some Basic Surfaces. Subdivision and Homeomorphism. Extending Planar Drawings. Kuratowski’s Theorem. Algebraic Tests for Planairty. Planarity Algorithm. Crossing Numbers and Thickness. Directed Paths and Mutual Reachability. Digraphs as Models for Relations. Tournaments. Project Scheduling. Finding the Strong Components of a Digraph. Flows and Cuts in Networks. Solving the Maximum-Flow Problem. Flows and Connectivity. Matchings, Transversals, and Vertex Covers. Automorphisms of Simple Graphs. Equivalence Classes of Colorings.